Coffee with a Cop was first launched in the United States in 2011, in Hawthorne,California. Two years later, it had spread to 175 US cities in 36 states. The concept has done wonders to build and grow trust with the community and increase police legitimacy. 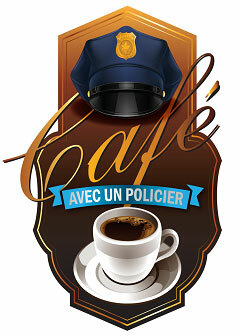 On May 13, 2014, the Québec version – Café avec un policier – was introduced in Blainville, Mirabel, Saint-Eustache, Deux-Montagnes, St-Jérôme and with the Sûreté du Québec. Since then, 22 police services in Québec have joined in, including the Service de police de la Ville de Montréal (SPVM). Since this initiative works so well with the SPVM’s vision of getting closer to the community, the organization started a Coffee with a Cop pilot project on November 12,2 014, at neighbourhood police station 42 (PDQ), in Saint-Léonard. Since then, more than 16 neiighbourhood police stations joined the project and many more will participate in 2018. To know if your PDQ offers this activity, consult their webpage. The Coffee with a Cop project provides another opportunity for SPVM officers to talk face-to-face with residents about their needs, expectations and ideas. The meetings also allow the SPVM to make contact with certain groups who might be reluctant to approach an officer in the street or call their neighbourhood station to ask questions. This direct contact allow the organization to gather information, identify problems and propose solutions. Of course, many SPVM officers have always taken the time to chat with the city’s residents. The Coffee with a Cop project is just a way to make it official and spread the idea.